And the winner is “None of the above” !!! It is the 16th of May. The day of reckoning for not only the candidates who are in the poll fray but also for the pollsters who have been predicting swings, vote shares and election results. I wake up early, finish my morning chores also early and plonk in front of the idiot box which will soon have experts who will make nonsense out of sense and vice versa depending on how the results swing. After all, this election has been touted as one which will change the destiny of our country in many ways than one. At this time I didn’t realize the tinge of prescience embedded in this statement. As is the wont, the first one hour indicates only leads and everyone except the one who leads dismisses them as very early trends. But I could sense some tectonic change waiting to happen. Much to my delight, the candidate whom I voted in my constituency was leading. And whom did I vote for??? This is a dilemma I always had when I went to the booth to vote. Whether to vote on the merits of the candidate in my constituency or vote for the party I want to see in power irrespective of the merits of the local candidate. More often than not I found that the party I want to vote has fielded a lousy candidate and the best candidate in my area belongs to the wrong party. But this time, actually 1st time for me I had the option to beat this dilemma by pressing the “None of the above” button and come out happy. And that’s what I did. And in my constituency None of the above is now clearly leading. Wait a minute. As counting progresses, in many constituencies across the country as the experts were getting flummoxed to explain (but still manage to justify that it was a clear wave not just against incumbency but also against the challenger and all other fringe players blah blah blah) None of the above was emerging as the winner by far. By evening as the Pan India results starting coming out it is clear that the Indian voter has once again spoken and spoken smartly. 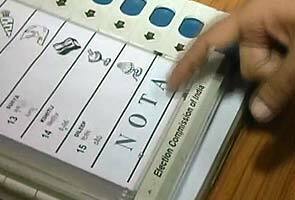 In the total 543 seats for the Lok Sabha no party or a Pre poll alliance emerges with a clear majority. Reason being, None of the above win in 220 seats out of the total 543. So BJP and the NDA get stumped for the 3rd time with just 120 and 156 seats respectively. The silver lining was the Congress. Silver lining – because it is exactly as per prediction. As one expected they end up at 90 with 77 seats going to the 3rd, 4th, Nth fronts. In the meanwhile all the None of the above candidates meet and elect their senior None of the above as their parliamentary leader who will become the PM. They shortly meet the President and stake the claim for forming the Government with BJP providing outside support. 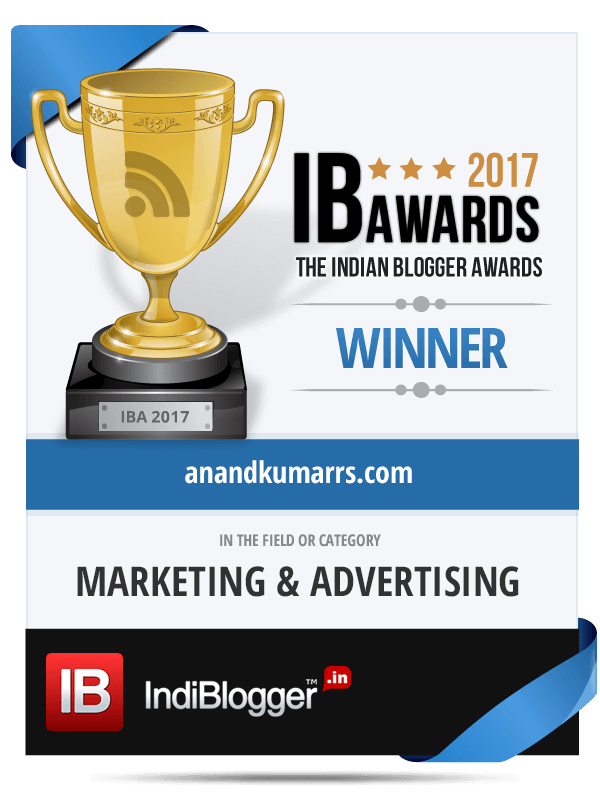 The next day newspaper headlines, TV tickers and Web banners scream – “Historic verdict – And the winner is None of the above”!!! Ranjay Garu: What is so unprecedented about this? I thought for the past 10 years we had one None of the Above as PM!!! What is wrong with you, blabbering None of the above, None of the above in your sleep?? This is the problem if you watch so much election rubbish on TV!!! Wake up now. I like Jaswant Singh. I think he was arguably India’s best External Affairs minister in the post Nehruvian era. I cannot think of another politician in that time who could have handled the diplomatic fall out of the Pokhran tests during the Vajpayee regime better than him. When I recently read his book – ‘A Call to honour-In Service of Emergent India’ where he elucidates the complex negotiations he had with the US leading to the relaxing of sanctions much earlier than the world expected, my respect for him went up a few notches. So it was extremely sad to see the same Jaswant Singh last week waging a lonely battle of sorts with his party for not nominating him from the seat of his choice. When the party wanted him to retire gracefully, he wanted to retire after a last race!!! He was visibly tired. Even the vocal energy was missing. Those grandiose articulation skills which helped him stave off many a diplomatic challenge didn’t come of use in his own turf battle. Diplomacy they say is “an art of give and take” or rather “appearing to give and take”. Jaswant Singh nor the party leadership was in any mood for even appearing to give in. The result – Mr. Singh had to throw in the turban in the election ring as an independent and has been expelled from the party. While the curtain on his career is certainly down if he loses, I am not sure if the climax will be anything interesting even if he wins. With this episode, has he become a foot note a petulant one in that in the party’s history?? History will judge. It’s not just Jaswant Singh. We have leaders across the spectrum of parties in India for whom a “graceful exit” is an alien concept. At an age of 87, one would expect a patriarch to provide abundant blessings, plentiful advice and be a fatherly figure. But, here we have Mr. Advani throwing fits about where he will contest for the next Loksabha elections. When his tenure ends he will be 92 – not an age one expects to have the energy to energize the nation of a burgeoning youthful population. 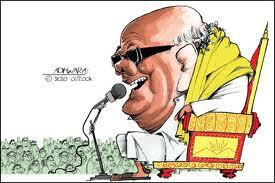 Giving him illustrious company is the “Kalaignar” from South – Karunanidhi who at 90 is doing all what he can to prevent the “Rising Sun” from sinking. The visuals of an immobile leader being wheeled from meeting to meeting his mastery over Tamil language notwithstanding are hardly inspiring. Is it just politicians?? Nope. In sports too, we have enough examples of exits happening only when push comes to shove. It was my humble opinion that even God aka Sachin Tendulkar called his retirement a couple of years late. In the context of retirement, a very used cliché is – “One must exit when people ask why now and why not?” However if one surfs through history of legends, it is mostly of the “Why not” variety. Whether it was Kapil Dev or Saurav Ganguly. That’s why a Sunil Gavaskar who stepped down from captaincy after a World Championship win or retired from tests after one of his best knocks is still respected and that’s why a Rahul Dravid who decided to hang up at the 1st sight of self-doubt will be spoken with high regard. This disease has plagued industrialists who run empires as well. I know of a group where the Chairman who in his late 80’s still tries to be active in running the business. He used to say that he will stop attending office the day his son (in late 50’s) starts acting responsibly which is when he attends office on time!!! And his son used to claim that he will be in office on time the day his dad has confidence in him and stops attending office!!! Hence in this “I will not give up” atmosphere, one was pleasantly surprised to see Jairam Ramesh of the Congress declaring that in his party, leaders must retire at 70. It’s another matter that his party soon disowned his lofty comment as a personal lament. Let me for the moment limit this issue of “No Voluntary Retirement” to the sphere of politics as that is of public importance. It can be safely concluded that but for extreme bad health nothing else stops politicians from trying to be politically active. Are physical strength and mental alacrity not critical in matters of governance? Jairam Ramesh also added “People unfortunately in India don’t know when to exit. That is why most mentors become tormentors”!!! Is this “not stepping down graciously” an “Indian” thing? For want of adequate information, I am unable to conclude. 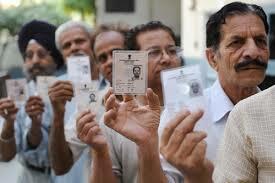 Is it time to amend laws to stipulate upper age for contesting in elections? Will the leaders who hang around themselves will ever come together to bring about this legislation? Only time will tell. Till such time, as Atal Bihari Vajpayee a man with a liberal gift of the gab once said “Na Tired, Na Retired” will be the overarching theme for our netas. “Young nation with Very Old leadership” is what looks like is preordained for our country. But I think the time has come for a national debate on this. Aam Admi Party’s most khas admi Arvind Kejriwal’s diatribe against media few days back brings back the neutrality of media in sharp focus once again. The last time it happened was when Radia tapes were leaked and hell cut loose only to be forgotten and forgiven in a few months. Stung by the open attack, most of the TV channels and newspapers picked up cudgels for media neutrality against Kejriwal. In fact the channels AAP subsequently named, (India TV, Timesnow,..) unleashed an all-out war against Kejriwal and AAP and came up with hour-long defences to shield themselves. In Timesnow’s case it was not defence but complete offence as Arnab Goswami’s (who else 😊) as is his wont ripped apart one hapless AAP chap that night in Newshour (where else 😊). The key question is – “Is Neutral Media an oxymoron?? ?” Before answering that question few associated ones pop up. Can media be neutral at all??? Is media neutral today? – Certainly not. How can it be? In the age of cut throat competition and proliferating options – it is struggle for existence and survival of the smartest. Being smart include being owned by corporates and barons who have deep pockets, being flexible in editorial content, packaging “News” with “Views” and taking a slant politically to reap the rewards. So it is not surprising that many of the media groups are owned by politicians or corporate bodies. They have not invested certainly for charity. If a channel or publication is owned partly or in full by a politician, can we expect neutral reporting on the wrong doings of his/her party? In the same lines if the channel is funded or owned by a corporate group with varied interests, can we expect the channel to report any scandal happening in that group? Was media ever neutral? I don’t think so. Today when we say media, we mostly refer to the 24*7 TV news channels. But much before histrionics and hysteria took over our drawing rooms every evening, mainstream media was mainly newspapers. 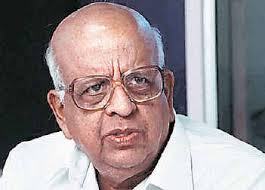 Even in the glorious print era of The Hindu, The Times of India, Hindustan Times, Malayala Manorama, The Indian Express,.. it was a known fact that the owners of most of these papers belonged to political parties and used their paper legitimately to pedal their parties’ cause. So, while you had news reports and events there were the editorial and Op-ed columns to proliferate opinions with a particular slant. This tradition if I may say so continues till today whereby newspapers give a particular angle as per their compulsions. This is more than evident in the Radia tapes. Can media be neutral at all? I doubt. For reasons espoused earlier like rampant competition and lesser value system these days it is and will be increasingly difficult for a media house to stay neutral and survive. Many proclaim to be but it is difficult to fathom how they can be. While it is a fact that media plays a major role in forming and influencing public opinion, it is for the same reason that it is manipulated. It is extremely difficult to pick up one anchor/journalist today who can be said with confidence that he/she is neutral and his/her opinion can be respected. So the only option as readers and viewers is to understand and realize that Neutrality and Media cannot go together and take what we read/see with a fistful of salt. As responsible citizens it may not be very wise if we take decision on who to vote based on what is mentioned in the media. For example the same Bihar which till a year ago was the emerging state with all round development is back to being a “BIMAR” state (after Nitish broke off JDU’s ties with BJP). Similarly the same press which hailed Akhilesh Yadav as “THE” Yuva Neta when he won, is trashing him to the dumps. To me there was nothing spectacular about him then and nothing so worse now. The concept of WYSIWYG (What you see is what you get) may be popular in the context of “Text Editors”. But in the context of “Gen Next News Editors” it seems to be an obsolete idea. We saw that in the leaked Kejriwal-Punya Prasun Bajpai video (watch here) where even Kejriwal’s shenanigans were exposed. As I mentioned in my earlier post (read here) for the same reasons of survival, a marketing plug is masqueraded as news item and slipped in. So at our own peril we can decide on buying that product believing what is written in that news item. Same is true for political stories. Bordering cynicism, let me say this and close. In our great theatre of democracy our media provides 24*7 (mostly free) entertainment. So lets’ enjoy as the Arnabs and Rajdeeps battle it out with the Kejriwals, Lekhis and Tiwaris and “experts”. But form our opinions and cast our vote as per conscience and not based on what we read or see. Neutral umpires in Cricket became a reality long time back. But Neutral umpires in Media is still imaginary. The loud Wake “AAP” Call!!! 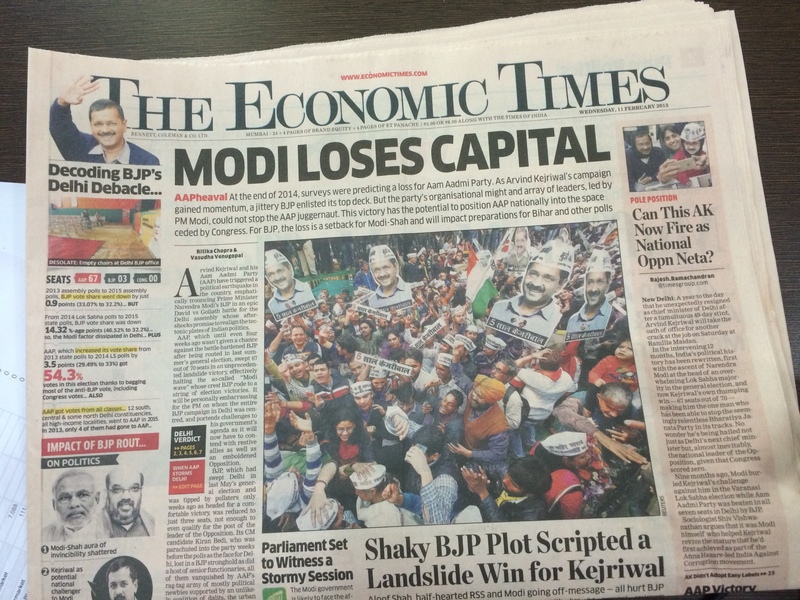 Did I want AAP to fail like this??? Certainly not. I maintain that the time has come for an alternative way of politics in the country and AAP briefly provided that and I hope they will continue to. Some of their moves do deserve more lenient and generous commentary. 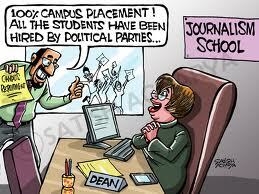 In India political parties think of manifestos only before elections. Once elected, the manifesto is archived meticulously only to be retrieved and “Operation copy/cut/paste/find/replace” done before the next elections!!! Even in the short 49 day raj, AAP demonstrated their seriousness towards fulfilling the promises made in the manifesto. Once in power as seen in recent times mostly as a coalition, the mainstream parties have thrown the alibi of “Coalition compulsion” for not implementing their core party promises. Usually the larger party agrees to the conditions of the smaller party to form the government. 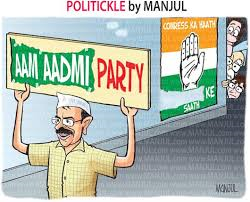 Here the smaller party (Congress in this case) agreed to toe the line for supporting the larger party (AAP) to form the Government without seemingly extracting its pound of flesh!!! Time frame is something political parties never bother about except in situations which suit their convenience. One was pleasantly surprised to see AAP trying hard to do things in a hurry. To be fair, these are things unheard of / unseen in Indian politics. Having said that, AAP certainly could have done things differently rather than changing Delhi into a theatre of “AAPsurd” in the past couple of months. When I was in Delhi 2 weeks back, a resident told me this – “Delhi these days has become like Kolkatta. You never know what dharna is going to happen, where and how it will affect daily life”!!! Well, that’s not a very charitable comment. Having come to power due to the strong power of democracy, there is no way the ruling party can change democracy to “dharnacracy”. In the spirit of fulfilling the promise made in the manifesto (which in the 1st place smacks of ludicrousness) you cannot waive off penalties for those who failed to pay power bills in support of your agitation. Tomorrow a Sena can start an agitation calling for burning a few trains and when they come to power can announce lifelong free passes for all those who supported them on their agitation. How ridiculous is that??? To AAP: As many pundits keep saying, once part of the political system which has brought AAP to power it is important to focus on governance and shed the street fighter stripes. People are yearning for change and when in power, change is best brought by using authority to bring in governance. An apple a day can keep the doctor away. But an AAP overkill a day will keep all well-wishers away!!! To Main stream political parties: As demonstrated by AAP within the short period of existence, there is a compelling need to change the discourse of the past. Patience may be a virtue but today’s generation has very much less of it. Choose candidates based on merit, performance matters and to people nothing matters except issues related to their day-today well-being. Read as jobs, income, family’s future,… Hence single-minded focus on Governance and carrying out things in a timely fashion is what people expect. Chai pe charcha and Bharat Nirman campaigns are all fine. But once in power, charchas in parliament have to result in Desh Nirman, and not in shameful “Pepperspray” abhiyaan!! To the Aam admi: In the next few months, the aam admi will get a chance to express him/herself. The next 2 years will decide if India will become a developed nation or continue to be a perennial emerging country. It is important to differentiate the expectations from a local body election to a state election to a Lok Sabha election and vote accordingly. The last 25 years we have suffered due to fractured mandates. In today’s world an absolute majority will make a difference at the centre.. Hence it will serve us better if we use our precious vote to bring a stable party/pre-poll coalition at the centre rather than a fancy front with regional parties which jump on to the bandwagon as post-poll partners bargaining for “ATM” ministries and pulling in NEWS directions! And vote for individuals who show capability and tendency to make a difference. Downloading in Delhi – the app of the season!!! On the same Sunday two weeks ago, Indians in general and Dilliwallahs in particular were waiting in bated breath as the counting for the state elections was in progress to know who will be the next Chief Minister(CM). 2 weeks hence one is still waiting to know who will be Delhi’s next CM as another counting is underway and announcement of result is awaited tomorrow. Few years back (2008 I think), IDEA cellular ran a TVC for their mobile service in which politicians were seeking opinion from people on an issue related to governance thro SMS polls. That time the idea of seeking referendum using technology streams like mobile/internet seemed like an extreme fantasy of a creative brain. However the Aam Admi Party (AAP) the new kid on the block in India’s politics has been in the forefront of re-writing the rules of the game and what seemed like fictional has indeed become a reality. As I type these words, in a reality show type SMS poll, AAP is conducting a referendum exercise in Delhi on whether to form the Government or not. Everyone is in unison when they say that this Delhi Election has seen a new coming of age of Indian democracy. And this has been mainly engineered by the presence of AAP in the election ring. Can you imagine of a situation few years ago where the single largest party with few seats short of majority soberly declaring that they will sit in the opposition and serve the people without making an attempt to form the Government?? To borrow from Vinod Mehta’s piece one feels that suddenly India these days has become “the Republic of Utopia – St. Thomas More’s imaginary state in which laws, government and social conditions are perfect”!!! From the days of “Aaya ram, Gaya ram” to “Hamare pass numbers hai” and the usual scenes of MLAs being holed up in some remote resort to prevent horse trading to today’s “Pehle aap, Pehle aap”, I think this is a fantastic and refreshing change. In that sense, AAP has already won the battle if not the war. Once the single largest party-the BJP showed no inclination to form the Government, there has been a huge clamour on AAP to stake claim for forming the Government with support from the Congress or BJP. The conundrum which ensued on AAP was understandable. “How can we take support even if its outside from any of the 2 parties whom we opposed tooth and nail during the campaign?? ?” “How can we form the Government somehow by striking a deal with the Congress or BJP when we were exactly against their wheeling dealing type of politics?? ?” So when this conflict played out, the AAP leadership took the stance of not staking claim and as per me rightly so. But they were reviled by the opposition first and then the press. “AAP is shirking its responsibility by not forming the Government” was one refrain. How can they, when they didn’t have the numbers or the mandate to govern on their own terms? “How will the people know what AAP is capable of if you don’t govern? Since Congress is providing “unconditional” support, AAP should stop posturing and take their support and change Delhi as you promised” – this is another missive. India’s political history shows “Unconditional support” means “And Conditions apply for support”! So I’m not sure if Congress will play ball on all initiatives and changes AAP wishes to usher in Delhi. Maybe they will. May be times are changing. So all this egging of AAP to somehow form the Government is as per me a well thought of strategy by the parties to make AAP govern and then flounder. After all how has AAP managed to capture the imagination of people in a short time? Not just by promising to root out corruption but also to govern with Aam Admi’s interest in mind on every issue. If AAP comes to power and makes mistakes, it will be good news for BJP and also Congress when they face the same public in 2014 for the Lok Sabha polls. But if AAP does really govern well, still 6 months is a short period to make any impact which will affect 2014 elections. So the National parties with their sights firmly on 2014 Lok Sabha polls want AAP to rule and probably fail. On the other hand, if AAP had stuck to the original stand of not forming the Government under any circumstances, may be Delhi would be subjected to President’s rule and re-poll held along with Lok Sabha polls. That would have been a win-win situation for AAP. If they win with a majority then, they get full undisputed mandate of Delhi and they can rule without anybody looking over their shoulders and give the Governance they promised. If they lose and BJP gets a majority, they can sit in opposition. It allows for some time for the young first time legislators to learn and prepare for the long haul in the future. At the same time they can continue to put pressure on the Government like they are doing today and bring in paradigm changes. Somehow my take is AAP is best suited to be in opposition and bring in changes rather than govern. While everything else of AAP is inspiring hope, somehow their economic agenda is not. It smacks of more socialism, Anti-business and hence worrisome. Hopefully they will change their thinking when they understand what matters most to Aam Admi. It is not doles but jobs and hence empowerment. The only issue is what will happen if it’s a hung assembly again with no clear majority. I feel that there is lesser chance for the same as constituencies where either AAP or BJP won with smaller margins will vote more decisively the next time over. Somehow in the last few days, coming under pressure from media and commentators, AAP leaders decided to dilute their stand from “Not forming the Government” to “Will form if people say so”. Hence that “What an idea, Sirji” was put to use.